• Provide an overview of the Public Works Defense Infrastructure Sector’s roles and responsibilities as they apply to the Defense Critical Infrastructure Program (DCIP) and the Sector’s current support and ongoing initiatives towards the program. • Mission – Enhance risk management decisions at all levels to ensure that Defense Critical Infrastructure is available when required. 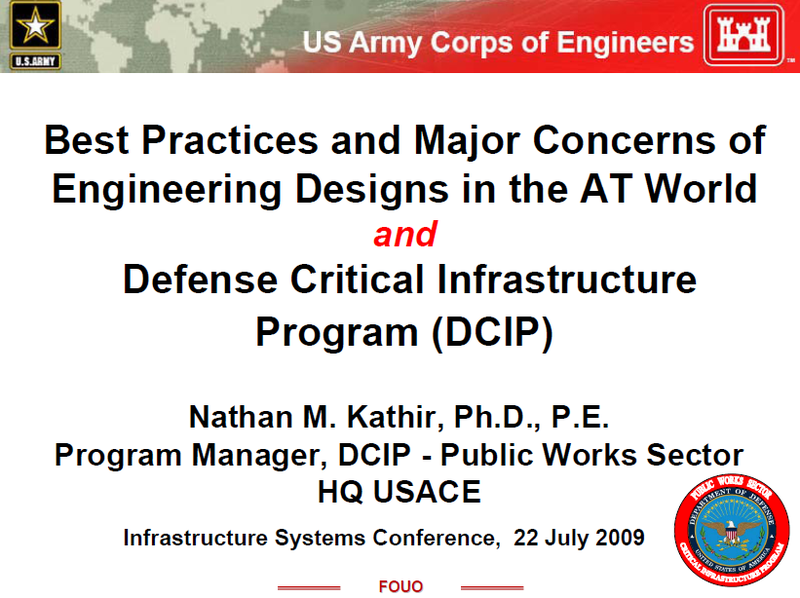 • The DoD Critical Infrastructure Protection Plan (1998) tasked USACE to be the Defense Sector Lead Agency (DSLA) for the Public Works Defense Infrastructure (DI). 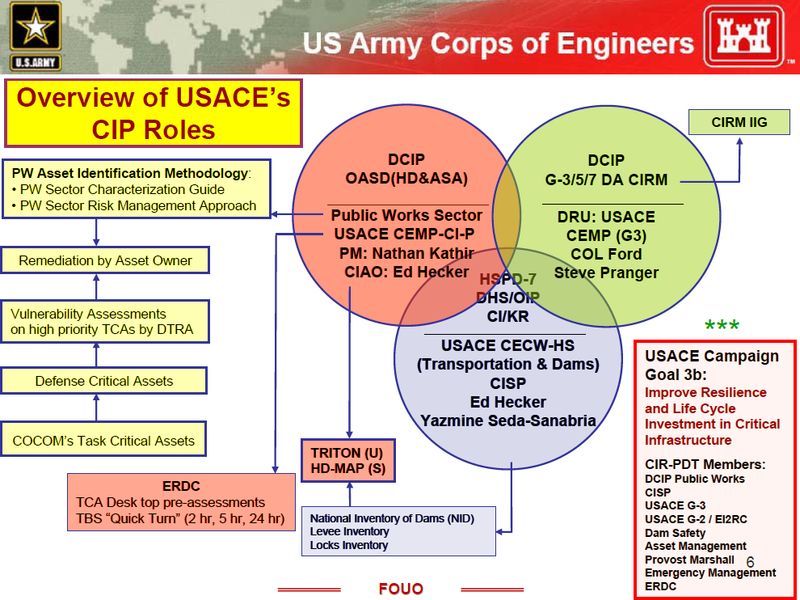 USACE has been active as the Public Works DSLA since then. • HSPD 7 (2003) – Overarching guidance document. 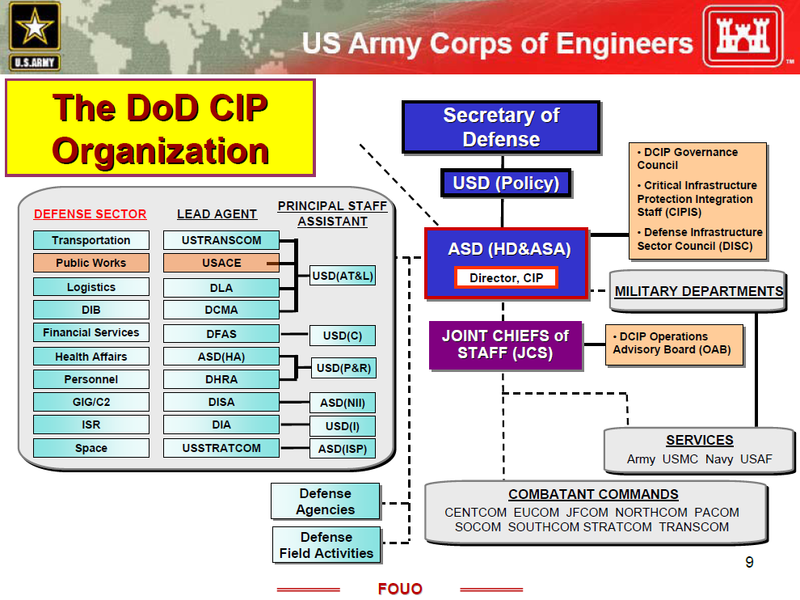 A virtual association within the DCIP that traverses normal organizational boundaries, encompasses defense networks, assets, and associated dependencies that perform similar functions within DoD, and are essential to the execution of the National Defense Strategy. The DoD, government, and private sector worldwide network, including the real property inventories (environment, land, buildings and utilities) that manages the support, generation, production and transport of commodities (e.g., electric power, oil and natural gas, water and sewer, emergency services, etc.) for and to DoD users.